Under construction. Page Updated August 12th, 2001. Photos of the Daggers added. More to come. 4b) Beginner Blacksmith's Gargoyle Dagger. A beginner's introduction to blacksmithing with a fun theme project. No prior experience is necessary nor does the smith need to attend any of the other classes before attending this class. In this basic level class, new smiths are only being introduced to the art of smithing and aren't being taught the "dirty work" of making the tools to do the job or how to make any modifications to the tools or finished objects. 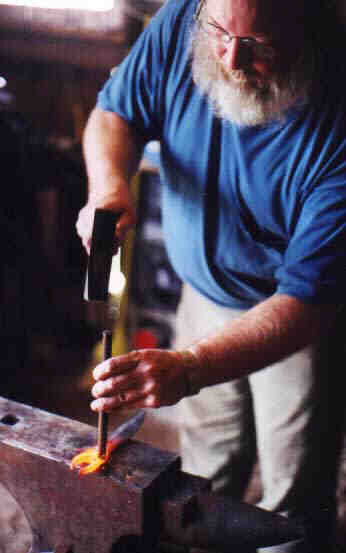 We will be using traditional ironworking techniques used by blacksmith's for centuries. No modern welders are used for this project. Just a fun class for beginners. All students will keep the dagger they make. The Dagger (4b). A simple dagger or letter opener incorporating a carved steel handle and a flat style of gargoyle head. Made of one single piece of mild steel. The Gargoyle dagger is an interpretation of a series of faces forged by the smiths who worked with Samuel Yellin. The head forms a decorative pommel and an ornate body of the handle, a simple double edged blade completes the dagger. The dagger is best suited as a letter opener. The photo at right is an example of the dagger. The shop (4b). We have two permanent forging stations set up with two sets of hammers and several sets of tongs. All tools are supplied by the shop. Class size is limited to 4 people due to number of forging stations and tools available. No junk tools here. All tools are the best we can make or buy. There is a sidedraft forge with hand cranked blower and a large cast iron forge also with a hand cranked blower. Both forges equipped with firepots so students will have the best fires. Sturdy welded anvil stands support the anvils with no wiggle or rocking. Photos of the shop can be seen on the main classes page by hitting your Back button or using the Back to Blacksmithing Classes Page at top of this page and then scrolling down to the middle of the page. Update August 12th, 2001. The latest class was successful. Everyone went home with their own daggers. More classes are being planned for some time this fall and coming spring. Cost of this class is $20. 4) Animal heads. To be announced. Mostly larger animal heads to be used in future projects. Upcoming classes to make oxen heads. Under construction. The advanced animal heads classes will focus on styles of animals we will be making for the advanced projects. More details of these classes will be made available when we get to that point.